You are here: Home » I believe! Okay, a little melodramatic I know, but what a great day! The Olympics are over! Hahahaha! It was capped off by an unbelievable, nail-biting, euphoric win by Team Canada over Team USA. I watched the action at home, right where I wanted to be! 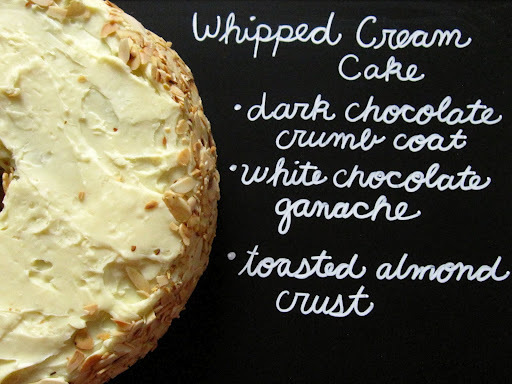 This week’s featured recipe, as illustrated above was a Whipped Cream Cake, recipe care of The Modern Baker. Want to give it a try? Check it out here. Although the original recipe is for a layer cake, I decided to dust off my angel food cake pan (or tube pan, if you will) and give it a try in that form. It worked – but at double the cooking time! It is a really moist cake, as it is pretty much half whipped cream. So I guess it kind of turns into a pudding-cake type of baked good. But boy did it smell good. I was tempted to cut a slice while it was still warm – it was very moist with the crunchiest top (high white sugar content) but I held off until after decorating. 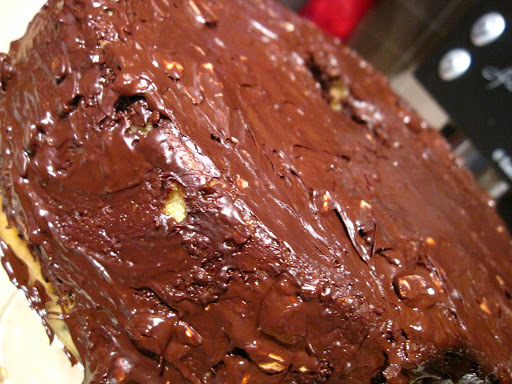 After making the cake, I doused it with a mixture of Frangelico and Triple Sec and sealed it in with a coating of dark chocolate and almonds. 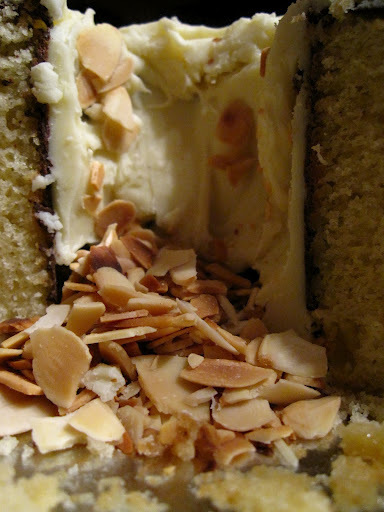 After a brief chilling I coated the cake with a white chocolate ganache (previously used on coworker birthday cake) and then coated the sides with toasted almond slivers. Mmmm. Good eats. 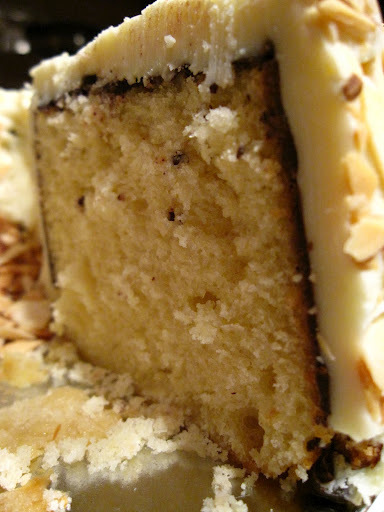 I have to say the recipe worked out pretty well, it yielded a delicious, moist, and dense cake and the white chocolate ganache was thick and set very well. I’m not sure if I posted the recipe source for it, but here it is! Very good instructions and nearly fail-proof. The first time I tried it, I halved the recipe – but this time I made a 2/3 portion. I would stick to a portion as close to the original as possible, halving it created slightly mixed results (a little bit too wet), but this time I did add more white chocolate to add stiffness to the final product. 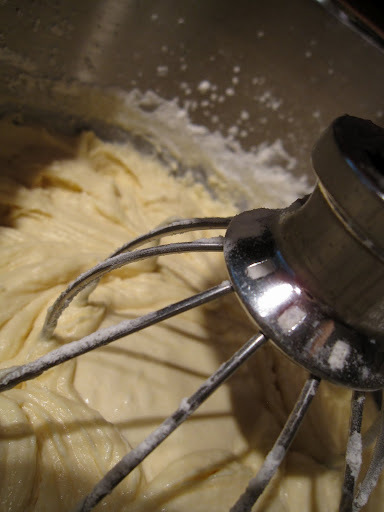 Either way – like the recipe says, it turns out like butter (like buddah) and goes on nice and smooth. Do not succumb to the fear of white chocolate! She is a fickle beast, but when it’s good….it’s goooooood. I can definitely vouch for this cake deliciousness! Very moist, not overly sweet – pure goodness.